In this class, you’ll practice making Wire Wrapped Links and interlocking them together as you build your bracelet. This technique of connecting Links together is the basis for creating longer dangles as well as your own Beaded Chain. 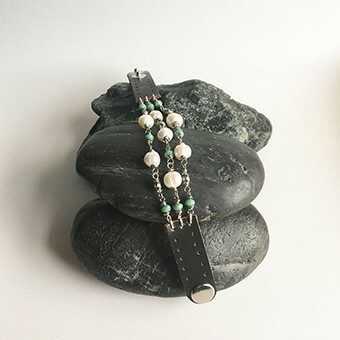 Top it off by adding the Beaded Chain segments to a Leather Bracelet Blank, and you’ll end up with a beautiful bracelet design to wear and share with others! You’ll have plenty of materials, if time allows, to make a coordinating necklace and earrings.